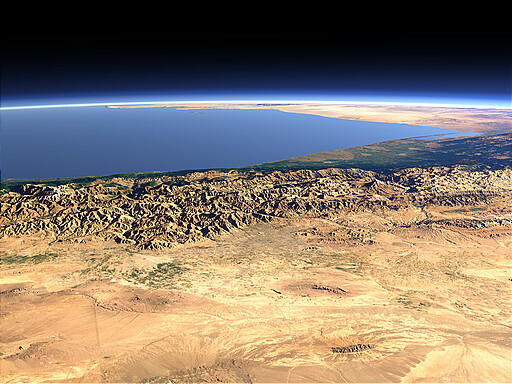 In the northern part of Iran north of the city of Teheran in the center of this view separate the dry central Iranian plateau from the humid and green costal region at the Caspian Sea which can be seen in the background. Hi, thanks for your nice job. its amazing that we can see our planet from above. tanks for your attempt to provide this map and good pics. i`m studying ecology and i need this pics to presentation. thanks so much for photo's. 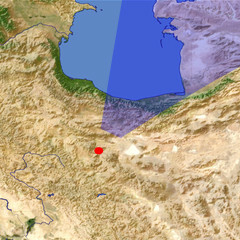 Would you please take more photo's from another place of Iran,for example west of Iran. The human are very small !!!!! THANK YOU . I HAVE NEVER SEEN THIS BEAUTIFUL PICTURES BEFORE . THAT'S FANTASTIC . Tehran like a colony of bacteria ! It seems some folks are so excited since this is their first experience of images of Iran from sky. These are not real pictures but computer generated geospatial 3D maps. Thanks for your nice pictures from IRAN. Iran is very nice country .Specially on North, where you can find very blissful weather and wonderful jungle and also seaside. I thanked very much from this site. Please bring more pictures from iran. showing 5 of 16 comments. Show all.